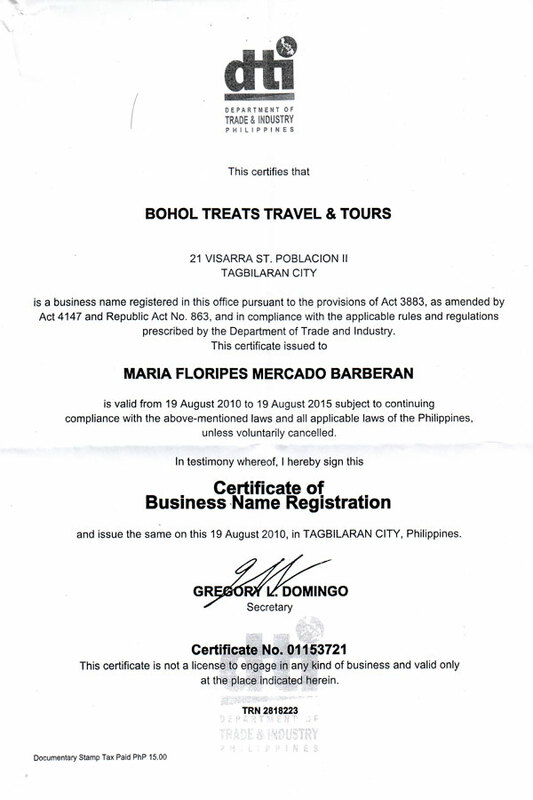 Owned and managed by Ms. Floripes Barberan, a DOT licensed tour guide, Bohol Treats Travel and Tours has been serving its clientele since 2011. 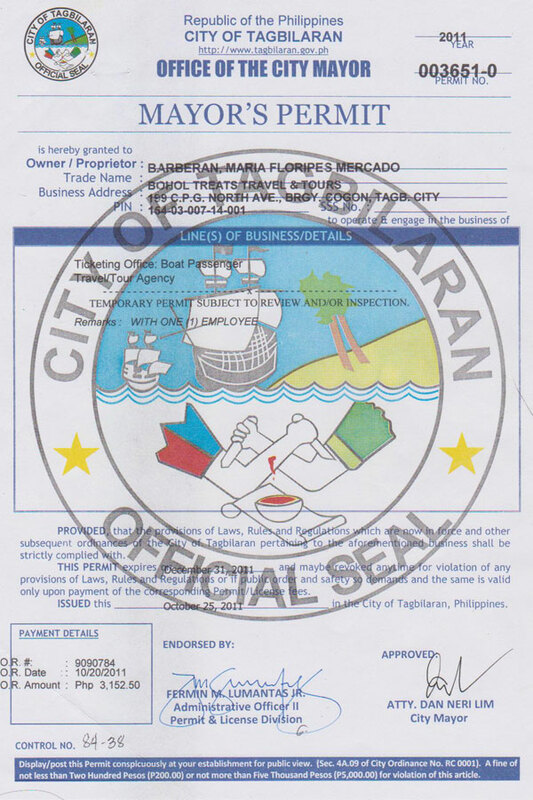 Throughout the years, we have gained a solid reputation as one of the most reliable and trustworthy travel agencies in Bohol. 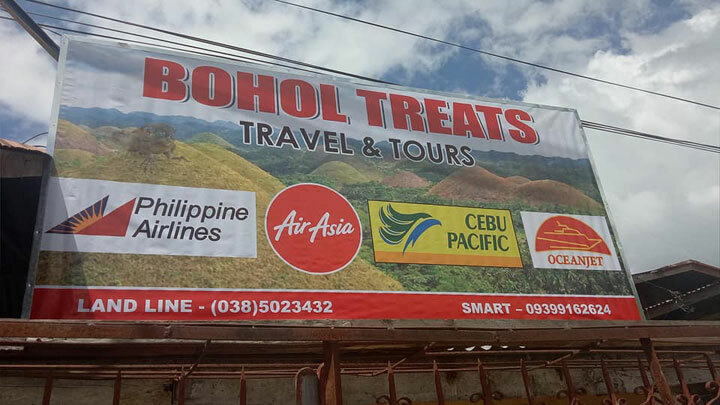 With more than 7 years of service and hundreds of tours organized, Bohol Treats Travel and Tours is the name you can trust when it comes to Bohol tours and travel. Browse our tours and travel packages or contact us for a free consultation. 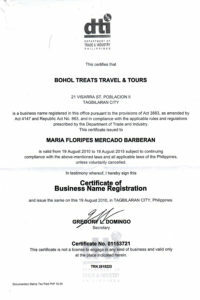 Bohol Treats Travel and Tours is a duly-licensed and registered travel agency based in Dauis, Panglao Island, Bohol, Philippines. We are dedicated to providing the best Bohol tour and travel services at affordable costs. Our friendly and fluent English-speaking tour guides will help make your Bohol vacation an enjoyable and educational experience. Aside from that, we have a fleet of modern cars and vans ready to take you to Bohol’s top tourist destinations in comfort and style. We have several years of experience in providing Bohol tour and travel services to both local and foreign tourists. Our guests and clients include several local celebrities and famous personalities. We have consistently earned the trust and confidence of our clients with our excellent service and good reputation. To make travel more accessible to ordinary people from all walks of life by providing world-class travel services at competitive rates. To become one of the country’s premiere travel firms in the Visayas region by providing excellent, top-notch services coupled with exceptional customer support. 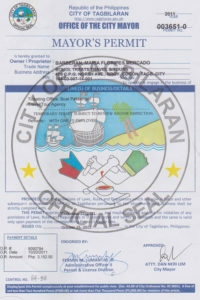 Our office is located in the municipality of Dauis, Panglao Island, Bohol, Philippines.